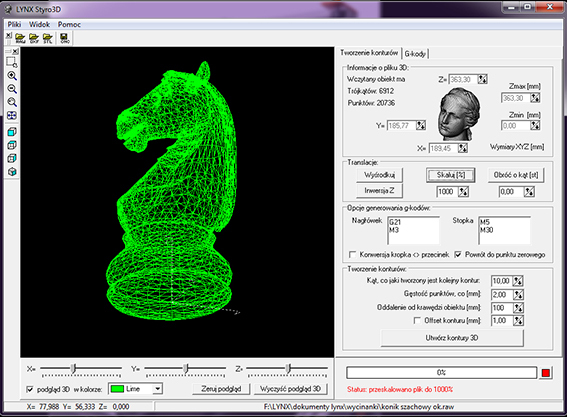 Turntable enables cutting all kinds of 3D objects, both symmetric (ball, vase, bottle) and asymmetric (chess horse, car, sculpture). It is a fully automatic, computer controled device, moved by a stepper motor. 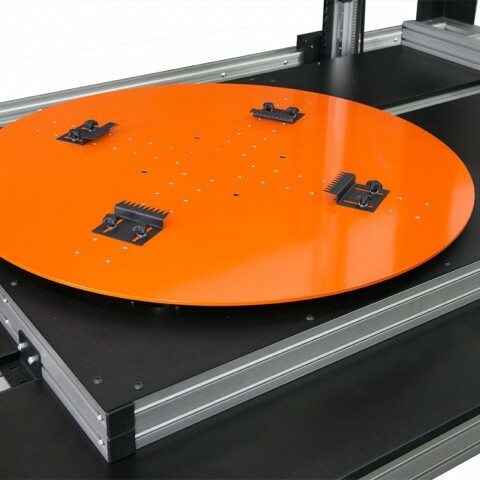 Turntable can be used with all models of LYNX hot wire cutter. You simply placed it on the machines table, put a block of styrofoam on it, and start cutting. There are two options for working with Turntable. 3D objects can be cut with Turntable and strait wire, or with Turntalbe and shape wire. This type of cutting is used, when customar wants to cut the number of elements of the same shape. Shapewire is a very thick cutting wire (1mm and more), which has beed bended to a contour shape of the symetrical 3D object. Than this wire is being mounted on the Shapewire grip. The cutting movement is very simple. The Shapewire goes inside the material and stops. Than the Turntable moves around by 360 degrees, and after it finished rotating, Shape wire comes out of the material. 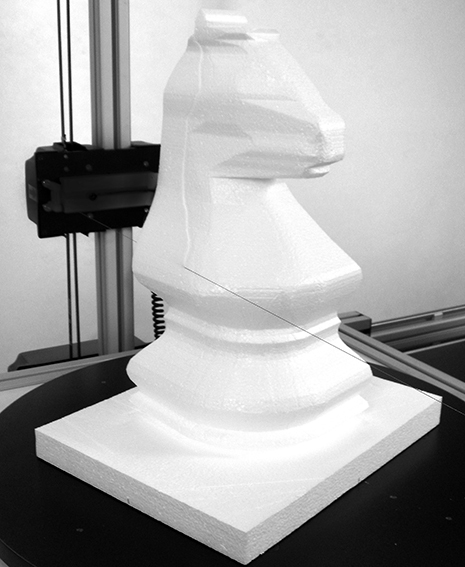 Asymetrical 3D objects (a car, a chess horse): Togehter with our Turntable every cutromar gets the STYRO3D software. This software is an automatic generator for cutting sections for asymetrical 3D objects. 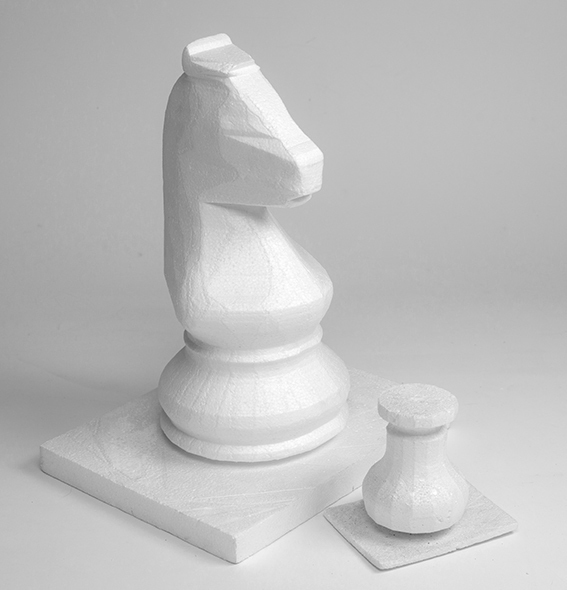 To cut this kind of 3D object, you always need a 3D project, saved as RAW, STL or DXF file. You simply import a 3D file to the STYRO3D, set cutting parameters and precision (number of cutting sections), and that’s all. Software automatically generates commands for cutting. Each cut will be different from the other, because each cutting sections in asymetrical onject is different. It would be impossible, to cut this kind of 3D object, withought STYRO3D generator. Symetrical 3D objects: When cutting symmetrical object like a base of a column or a vase, the oparator has to prepare only one contour for the 3D object. The contour can be drawn in TERMCUT software, or imported from other vector software into the TERMCUT. After that, there is only one more setting to be done. The operator must set number of cutting sections. It is possible to set from 4 up to 180 cutting sections for each 3D object. So set 4, for four-sided objects like: a cube, a house, a baluster. For smooth cutting and round elements, set about 30 cutting sections (moves). 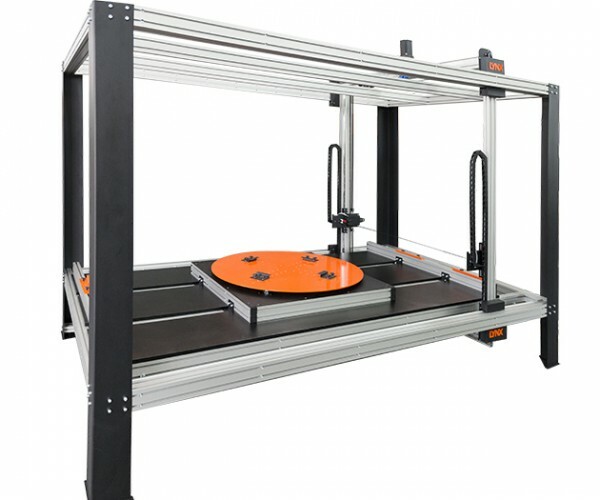 TERMCUT will automatically set an angle, by which the Turntable has to rotate, after each cut. The cutting process looks like this: once the project is ready, and the number of sutting sections has been set, the operator must place a block of styrofoam on the Turntable and set starting point. Than in one click you send the file with all settings to the machine, you just press start, and wait for the final result.